Bioelements Crucial Moisture preserves moisture and provides special emollients to the epidermis, immediately enhancing dry skin. This nutrient-rich moisturizer efficiently reduces facial lines, producing a younger looking skin tone. Bioelements Crucial Moisture is developed with restorative adaptogens, aromatherapist oils and high-speed hydrators, it helps in keeping your skin well balanced, making sure it stays elastic, moisturized and vibrant. It is full of potent, thirst quenching ingredients that polishes, heals and tones your skin. With balancing dong quai, restoring sandalwood and soothing lavender, dry wrinkle lines will instantly vanish. Produce a younger looking skin tone. Heals and tones your skin. Apply to whole neck and face, night or day. I have been using Bio Elements products for 3 years. I will not switch as their products do so well on my skin. Perfect daily moisture under makeup. Used for years and it never fails me. Always excellent. I'm very pleased with this product...it's not greasy or oily and moisturizes my skin so well. Really good for my dry skin. A lovely light instant daily moisurizer that does'nt seem to clog pores either. I was a big Clinique girl for years and was introduced to this product while visiting the States. Been using Bioelements for nearly 3 years and my skin has never felt so nourished and looks really radiant and fresh. Thick and rich moisturizer without greasy feel, love this product and keeps my skin hydrated all day. You don't need a lot as it goes a long way-small pea size is enough. A fantastic moisturiser for deep feeding your skin withour leaving it greasy. I am almost 50 and it works wonders. This is the best moisturizer I have used. I have very sensitive skin and it has never caused me a problem. It makes my face feel smooth and hydrated. The name says it all. Non greasey, Absolute best I have found. Skin-Beauty gets 5 stars from placing order to delivery AND they always have the best price. ProsIf you have dry skin, this is your moisturizer! I've tried cheap to expensive and this is by far the best balance of moisture (no greasy anything!). Love it!! Had a facial done quite some time ago and she used these prodcuts on me, bought them and have been using them ever sense. I m 60 yrs. old and my skin is not oily anymore and I need a lot of mosture. This product work great. Everyone compliments me on my skin. Love this stuff, particularly because you can use it morning or night so when traveling you don't have to take more than one container. But most importantly it is a great moisturizer -- keeps my skin from being flaky but not greasy! Great stuff at a great price!! I have used Bioelements products for some time now and this one is definately "crucal". My daughter and I both use it and love the way it absorbs into the skin without feeling heavy. Using Bioelements Crucial Moisture as my daily moisturizer I am able to keep my skin hydrated and protected. Since beginning the use of this light but effective moisturizer about a year ago, I have reduced breakouts of my skin and reduced the appearance of the lines in my forehead. I receive many compliments about my skin and how young I look. It makes me not only look younger, but feel younger. ProsThis is a light creamy texture that goes on easily and absorbs quickly. provides deep moisture while leaving skin feeling soft and clean. No greasy feeling. ConsNothing, I love this product. 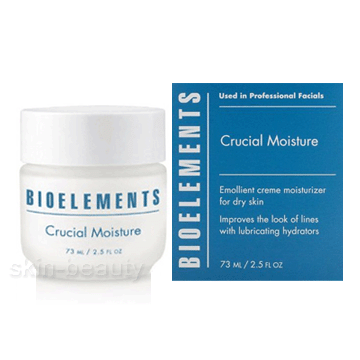 Bioelements Crucial Moisture - emollient creme soaks in in instantly decrease dryness and reduce surface wrinkles. Results in smooth, and soft and luxurious skin. Decreases fine lines and wrinkles May be used on a daily basis over the Protector, or through the evening. acacia (Acacia senegal) (acacia gum; black catechu; gum acacia; gum Arabic)—commonly used in traditional reme-dies as a soothing and anti-inflammatory agent. It is also used as a vegetable gum for product thickening. In extract form, acacia is recommended for dry, sensitive, or delicate skin. Acacia is the dried gummy sap from the stems and branches of various species of the African acacia tree. It may cause skin rashes in cases of allergy. açaí (Euterpe oleracea) pulp oil—appears to have powerful anti-oxidant properties and an ability to help regulate skin lipids, thereby promoting skin repair activities. Derived from the berries of the Açai tree (part of the palm family); its con-stituents include essential fatty acids (omega-6 and omega-9), vitamin C, polyphenols, and phytosterols. It is recommended for use in moisturizers, after-sun products, and cosmetic preparations destined to improve skin softness. acerola extract—credited with antioxidant and free-radical scavenging properties due to its high ascorbic acid con-tent. It is also hydrating and said to enhance capillary strength. Acerola is derived from the ripe fruit of the West Indies or Barbados cherry variety.